Key Difference: The primary difference between a real diamond and a fake diamond is that the real diamond forms naturally over thousands of years, whereas a fake diamond is created artificially in a lab. Basically, a real diamond is natural, whereas a fake diamond is man-made. Diamonds are one of the most popular gemstones in the world. They are known for their clarity and their fire, which is the way it shines when hit by light. It is often believed that the value of diamonds comes from the fact that they are so rare, however, that is not the truth. Diamonds are actually quite common. Their value comes from their popularity. If people are willing to pay it, then companies will charge for it. A diamond is basically carbon which has solidified into a harder composite due to temperature and pressure under the earth’s surface. Most of the diamonds have formed over 1 billion to 3.5 billion years ago. Today, they are mined through diamond mines and then cut according to their size and quality. Diamonds are popularly classified through 4 Cs: color, cut, clarity, and carat. There are many different types of diamonds, most are clear, but due to small defects they also come in a number of colors, such as yellow, pink, blue, etc. They also come in various clarities. Some are cloudy, others are clear. Cloudy diamonds have less demand as they don’t tend to shine alot. Another commonly held misconception for diamonds is that higher the carat and better and more expensive the diamond. However, that is not the case, cut is more important that carat. A diamond of a smaller carat but which is brilliantly cut, will cost more and look better than a diamond which is of a higher carat but is poorly cut. The clearer their color and clarity, the higher their carat, and better their cut, the more their cost. However, as diamonds are expensive, alternatives have now also become quite popular. Scientists have figured out how to artificially create diamonds by heating up carbon or hydrocarbon gas and applying the required pressure. This would not have been possible before, but science and technology has come a long way. 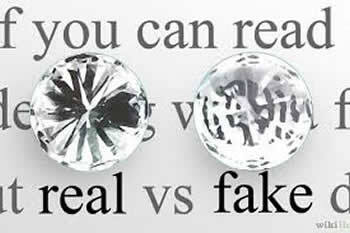 Fake diamonds fall under two different categories: Synthetic or Artificial Diamonds and Imitation Diamonds. Synthetic or Artificial Diamonds are man-made diamonds created by scientists in a lab, whereas Imitation Diamonds are made from other materials in which the final product looks quite close to a diamond. Imitation Diamonds are primarily made from Cubic zirconia or from high-leaded glass. Cubic zirconia is the most popular form of imitation diamonds. There is a huge market for fake diamonds, either synthetic or imitation as they are quite cheaper than diamond and are more easily available. They allow one to have the look and feel of diamonds, but on a much smaller budget. Another reason for the popularity is due to the ethical concerns associated with diamond mining. Diamond mines are often used to fund dictatorships and wars. These unethical mines also often use child labor to mine diamonds. Diamonds from these mines are called blood diamonds, however it is often difficult to prove if the diamond in question is a blood diamond or not. There are a number of differences between real diamonds and fake diamonds. In fact, there used to a negative connotation to ‘fake diamonds’. However, fake diamonds have become quite popular and are more readily available than real diamonds. In fact, more people tend to own fake or artificial diamonds these days than real diamonds, and this trend is more than likely to continue. Diamonds are a type of gemstone that have formed within the earth over billions of years ago. These gemstones are quite popular and expensive these days. Synthetic or Artificial Diamonds are man-made diamonds created by scientists in a lab, whereas Imitation Diamonds are made from other materials in which the final product looks quite close to a diamond. 4 Cs - color, cut, clarity, and carat. Carbon, hydrocarbon gas, cubic zirconia or silicon carbide. All have already been created. They are mined to be sold. Can be created as and when required.